The final voyage of the Edmund Fitzgerald began November 9, 1975 at the Burlington Northern Railroad Dock No.1, Superior, Wisconsin. Captain Ernest M. McSorley had loaded her with 26,116 long tons of taconite pellets, made of processed iron ore, heated and rolled into marble-size balls. Departing Superior about 2:30 pm, she was soon joined by the Arthur M. Anderson, which had departed Two Harbors, Minnesota under Captain Bernie Cooper. The two ships were in radio contact. The Fitzgerald being the faster took the lead, with the distance between the vessels ranging from 10 to 15 miles. Weather conditions continued to deteriorate. Gale warnings had been issued at 7 pm on November 9, upgraded to storm warnings early in the morning of November 10. While conditions were bad, with winds gusting to 50 knots and seas 12 to 16 feet, both Captains had often piloted their vessels in similar conditions. In the early afternoon of November 10, the Fitzgerald had passed Michipicoten Island and was approaching Caribou Island. The Anderson was just approaching Michipicoten, about three miles off the West End Light. Captain Cooper maintained that he watched the Edmund Fitzgerald pass far too close to Six Fathom Shoal to the north of Caribou Island. He could clearly see the ship and the beacon on Caribou on his radar set and could measure the distance between them. He and his officers watched the Fitzgerald pass right over the dangerous area of shallow water. By this time, snow and rising spray had obscured the Fitzgerald from sight, visible 17 miles ahead on radar. “The Wreck Site II” by David Conklin: Available online in the Shipwreck Coast Museum Store. As the afternoon wore on, radio communications with the Fitzgerald concerned navigational information but no extraordinarily alarming reports were offered by Captain McSorley. At about 5:20 pm the crest of a wave smashed the Anderson’s starboard lifeboat, making it unusable. Captain Cooper reported winds from the NW x W (305 ) at a steady 58 knots with gusts to 70 knots, and seas of 18 to 25 feet. According to Captain Cooper, about 6:55 pm, he and the men in the Anderson’s pilothouse felt a “bump”, felt the ship lurch, and then turned to see a monstrous wave engulfing their entire vessel from astern. The wave worked its way along the deck, crashing on the back of the pilothouse, driving the bow of the Anderson down into the sea. “By the way, Fitzgerald, how are you making out with your problems?” asked Clark. “Okay, fine, I’ll be talking to you later.” Clark signed off. The radar signal, or “pip” of the Fitzgerald kept getting obscured by sea return. And around 7:15 pm, the pip was lost again, but this time, did not reappear. Clark called the Fitzgerald again at about 7:22 pm. There was no answer. No reply from the Coast Guard. Captain Cooper tries again. The Anderson turned out to be the primary vessel in the search, taking the lead. With the ship pounding and rolling badly, the crew of the Anderson discovered the Fitzgerald’s two lifeboats and other debris but no sign of survivors. Only one other vessel, the William Clay Ford, was able to leave the safety of Whitefish Bay to join in the search at the time. The Coast Guard launched a fixed-wing HU-16 aircraft at 10 pm and dispatched two cutters, the Naugatuck and the Woodrush. The Naugatuck arrived at 12:45 pm on November 11, and the Woodrush arrived on November 14, having journeyed all the way from Duluth, Minnesota. The Coast Guard conducted an extensive and thorough search. On November 14, a U.S. Navy plane equipped with a magnetic anomaly detector located a strong contact 17 miles north-northwest of Whitefish Point. During the following three days, the Coast Guard cutter Woodrush, using a sidescan sonar, located two large pieces of wreckage in the same area. Another sonar survey was conducted November 22-25. The following May, 1976, Woodrush was again on the scene to conduct a third sidescan sonar survey. Contacts were strong enough to bring in the U.S. Navy’s CURV III controlled underwater recovery vehicle, operating from Woodrush. The CURV III unit took 43,000 feet of video tape and 900 photographs of the wreck. On May 20, 1976, the words “Edmund Fitzgerald” were clearly seen on the stern, upside down, 535 feet below the surface of the lake. However, the Lake Carrier’s Association vigorously disagreed with the Coast Guard’s suggestion that the lack of attention to properly closing the hatch covers by the crew was responsible for the disaster. They issued a letter to the National Transportation Safety Board in September, 1977. The Lake Carrier’s Association was inclined to accept that Fitzgerald passed over the Six Fathom Shoal Area as reported by Captain Cooper. Later, in a videotaped conversation with GLSHS, Captain Cooper said that he always believed McSorley knew something serious had happened to Fitzgerald as the ship passed over Caribou Shoal. Cooper believes that from that point on, McSorley knew he was sinking. Conflicting theories about the cause of the tragedy remain active today. 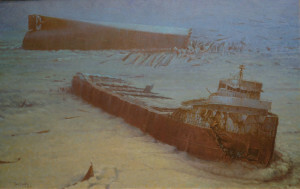 GLSHS’ three expeditions to the wreck revealed that it is likely she “submarined” bow first into an enormous sea, as damage forward is indicative of a powerful, quick force to the superstructure. But what caused the ship to take on water, enough to lose buoyancy and dive to the bottom so quickly, without a single cry for help, cannot be determined. Twenty-nine men were lost when the Fitzgerald went down. There is absolutely no conclusive evidence to determine the cause of the sinking. 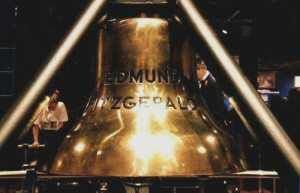 The bell of the ship is now on display in the Great Lakes Shipwreck Museum as a memorial to her lost crew. For books, videos, and memorabilia about the Fitzgerald, her loss, and her legacy, visit the Shipwreck Coast Museum Store online now.